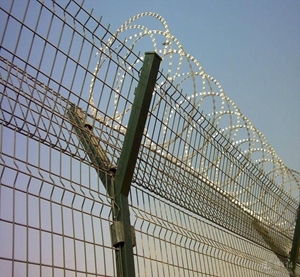 also called Y shape security protective fence, It consist of V-shaped Post, reinforced welded mesh sheet , security fittings and hot dip galvanized Razor Wire cage, high strength and security defensive. In recent years, has been widely used in airports , military bases, high- security location. 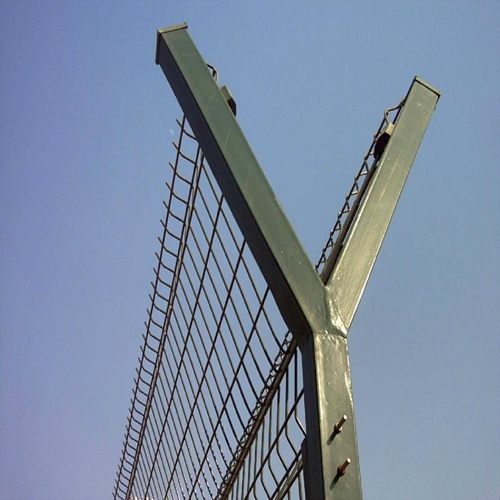 The mesh fence with V shape stiffener greatly enhances resistance to impact. square post: 60*60mm post with V shape support on the top, or 70*100mm hung connection post. Several mesh designs: small openings - no toe or finger holds. Several framework types: "C" posts; round posts; square posts - whatever works best. Sophisticated European Style: Used at the Euro Tunnel, Heath row Airport and elsewhere. The system designed to give attractive, long lasting and secure perimeter protection for retail, industrial and commercial properties, schools, and public utilities, it is ideally suited for electronic alarm and detection systems, Military, airports, secure units and so on. Looking for ideal Galvanized 358 High Security Fence Manufacturer & supplier ? We have a wide selection at great prices to help you get creative. All the Low Price High Security Fence are quality guaranteed. We are China Origin Factory of Airport Fence From Alibaba. If you have any question, please feel free to contact us.